We are excited to announce a week of Hatteras Island Holiday Deals – Shop Hatteras! Starting Monday we will reveal a featured shop each day with unique gift ideas and special discounts available in store and online just for Surf or Sound friends. You may not be on island time again for a few more months but that doesn’t mean you can’t do some Holiday shopping at your favorite Hatteras Island businesses! Pick up a few things you won’t find anywhere else and get everyone excited about your next beach vacation. 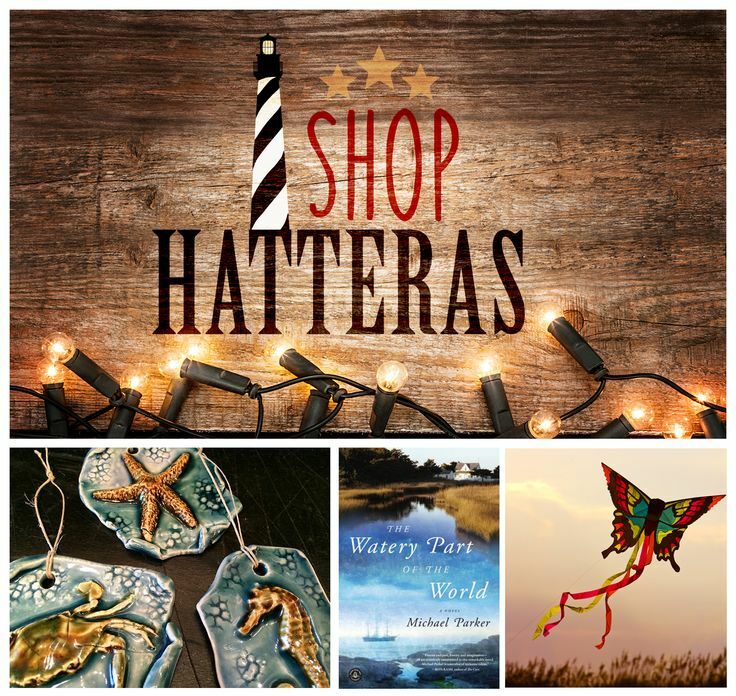 From handmade pottery to kites for kids of all ages to books perfect for curling up to read by the fire this winter, get ready to Shop Hatteras and give the gift of Hatteras Island this Holiday season! Check out our Shop Hatteras Pinterest board to quickly see all the deals in one place! Monday, December 8 – Shop Hatteras with Buxton Village Books! 10% OFF and FREE shipping until December 19 when you mention Shop Hatteras! Just browse the website at: www.buxtonvillagebooks.com – make your selections and call 252-995-4240 to place your order with the discount. Shopping locally? Get 10% off through Christmas Eve when you mention this offer! Tuesday, December 9 – Shop Hatteras with REAL Watersports Check out some gift ideas and great deals from the experts at REAL watesports, with offers ranging from free shipping to $100 OFF! Thursday, December 11 – Shop Kinnakeet Clay – Beautiful, affordable works of art hand-crafted by local and regional artists. Shop their online catalog and get FREE SHIPPING through December 19 when you mention Shop Hatteras! Hatteras Island Arts & Crafts Guild will have an arts and crafts show on Friday and Saturday, Nov. 27-28, from 10 a.m. until 4 p.m. at Cape Hatteras Secondary School on Highway 12 in Buxton. Linda Meyer Browning, award-winning watercolorist, photographer, and painting instructor, will be conducting a watercolor workshop for adults on Saturday, Sept. 12, and again on Monday, Sept. 14. “Watercolor for Beginners” will run from 11 a.m. to 1 p.m. and will be held at Linda’s studio in Frisco on Hatteras Island.